High-quality research evidence is critical for improving global health and health equity, and for achieving the World Health Organization (WHO)'s objective of the attainment of the highest possible level of health by all peoples . This need is most apparent when responding to complex epidemics such as tuberculosis (TB). TB is the leading killer among diseases caused by an infectious agent worldwide, the leading killer of people with HIV infection and a leading cause of death from airborne anti-microbial resistant infections, taking heavy tolls on human lives, communities and health systems at large [2, 3]. WHO estimates that TB caused illness in 10 million people and claimed an estimated 1.6 million lives in 2017 alone . The WHO End TB Strategy, in the context of the Sustainable Development Goals (SDGs), lays ambitious goals and milestones to end the epidemic by reducing incidence and mortality by 80% and 90% in 2030 compared to 2015: such reductions can only be achieved if there are major technological breakthroughs by 2025 . Critical research is needed to acquire rapid point-of-care TB diagnostics, including for drug resistance; shorter, safer and simpler regimens effective against drug-susceptible and drug-resistant TB, as well as latent TB infection (LTBI) that are appropriate for treatment of TB/HIV co-infection; and a new TB vaccine that is effective both before and after exposure. These require scientific advances in the discovery and development of new biomedical tools, together with innovative delivery mechanisms to effectively adapt and adopt new technologies and optimise the necessary linkages and integrations with other health services and sectors. For this reason, “Intensified research and innovation” has been identified as one of the three essential pillars of the End-TB Strategy. This editorial summarises the research questions identified through recent WHO TB policy guidance to increase the quality of evidence for policy-making. Based on evidence arising from research, WHO is mandated to produce recommendations to guide clinical practice and public health policy for TB prevention and care in response to demand from public health decision makers. WHO guideline development groups (GDGs), which include researchers, the health workforce, civil society, as well as end-users of the guidelines, such as policymakers from government, professional associations and other constituencies, are appointed by WHO to develop policy guidelines . A GDG meets with the primary objective of agreeing on the scope of recommendations by reviewing evidence, structured according to the standard framework of population, intervention, control, outcomes (PICO). This permits a systematic study of relevant evidence, the formulation of recommendations and the identification of knowledge gaps that need to be addressed through high quality research conducted in various epidemiological, demographic and geographic settings. The research questions highlighted in this document arose because the respective GDGs agreed they were critical for increasing the certainty/strength of existing recommendation, and/or for stimulating the development or optimisation of new recommendations that can lead to improvement in patient health and welfare. This step is an integral part of the WHO guideline development process (see, for example, the discussion section of Falzon et al. ). Among the major challenges facing global policy guidance development in TB are the shortage of good quality evidence exacerbated, for example, by lack of sufficient clinical trials with direct evidence of clinical benefit or improvement in an established surrogate for clinical benefit; data inaccessibility including for programmatic experiences of benefits and safety of interventions in real world setting; or when the evidence being presented does not address broader questions of values and priorities that go beyond medical interventions (e.g. acceptability, feasibility, resource distribution and health equity). Evidence obtained from well-designed, large scale multidisciplinary studies with robust testing of interventions are therefore needed to improve the strength of future guidance. The most up-to-date WHO policy guidance documents for TB prevention and care are summarised in a Compendium of TB Guidelines and Associated Standards [7, 8]. Using this compendium as a reference, we compiled a list of 155 research questions across the continuum of TB prevention, diagnosis, treatment and care (also summarised in table 1): three related to early detection; 35 related to diagnosis of TB disease, 10 related to the diagnosis and management of latent TB infection, 38 related to treatment of TB disease, including drug-resistant TB; 38 related to the management of TB/HIV and malnutrition; and 31 related to childhood TB management . Because these research questions are limited in scope to needs identified during guideline development processes, the majority of the questions highlight gaps at the policy/implementation interface (figure 1). Systematically linking such research questions to public health goals requires collaboration among funders, researchers and end users to ensure that funded research represents value for money, not only through the generation of new knowledge but also by contributing to health and economic outcomes. There are several ways of accomplishing that. The National Institute for Health Research Public Health Research Programme (NIHR PHR Programme) in the UK, for example, includes public health decision makers in its decision-making committee, and subsequently, the research it funds has been shown to align with priorities highlighted in national guidelines . However, this is not the practice across all research funders. An exploratory qualitative study of funding strategy among five high-profile public health research funding organisations showed limited involvement from end users/policymakers in the prioritisation of research questions for funding . Considering the need for well-funded, timely and high quality research for policy, funders should capitalise on opportunities to strengthen participation of policymakers and other end users in generating priority-driven research funding streams. 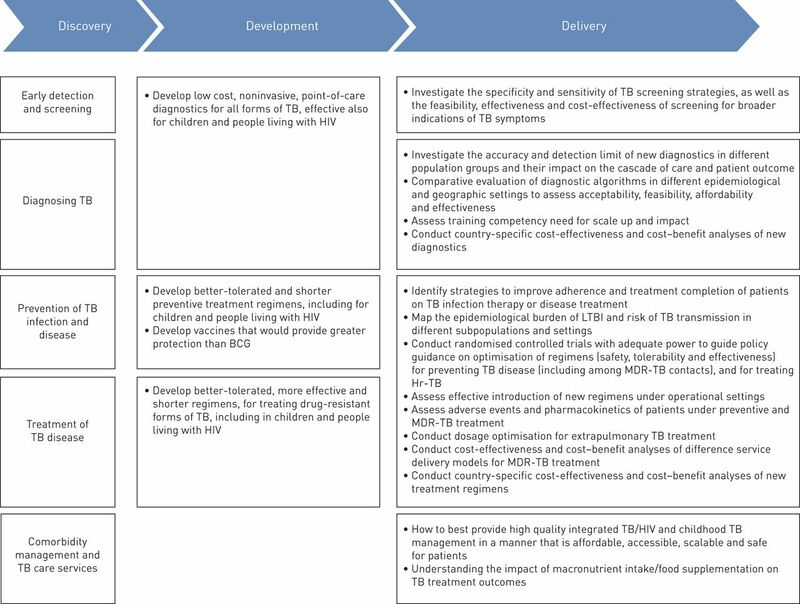 Representation of the research questions documented in World Health Organization tuberculosis (TB) policy guidance documents. BCG: bacille Calmette–Guerin; LTBI: latent TB infection; MDR-TB: multidrug-resistant TB; Hr-TB: isoniazid-resistant TB. At a time when there are many competing demands on limited resources, the WHO and its partners, countries, civil society and affected communities have a joint responsibility to ensure that TB research investments help achieve the goals and targets of the End TB Strategy and the SDGs. In recognition of this need, a TB resolution adopted at the World Health Assembly in May 2018 requested WHO to develop a global strategy for TB research and innovation, “to make further progress in enhancing cooperation and coordination in respect of tuberculosis research and development” . Considering the significant funding gap for TB research (USD 1.3 billion gap in 2017 when benchmarked against the targets outlined in the Global Plan to End TB 2016–2020: the Paradigm Shift), such coordination and collaboration is envisioned to help direct time and resources to the most urgent evidence needs faced by TB policymakers [14–16]. Conflict of interest: N. Gebreselassie has nothing to disclose. Conflict of interest: D. Falzon has nothing to disclose. Conflict of interest: M. Zignol has nothing to disclose. Conflict of interest: T. Kasaeva has nothing to disclose. The content of this work is copyright of the authors or their employers. Design and branding are copyright ©ERS 2019. Constitution of the World-Health-Organization. Public Health Rep 1946; 61: 1268–1277.
. Global TB Report. Geneva, World Health Organization, 2018.
. Tackling Drug-resistant Infections Globally: Final Report and Recommendations. London, The Review on Antimicrobial Resistance, 2016.
. Handbook for Guideline Development. 2nd Edn. Geneva, World Health Organization, 2014; p. 179. World Health Organization treatment guidelines for drug-resistant tuberculosis, 2016 update. Eur Respir J 2017; 49: 1602308.
. Compendium of TB Guidelines and Associated Standards. Geneva, World Health Organization, 2018. The World Health Organization standards for tuberculosis care and management. Eur Respir J 2018; 51: 1800098.
. Priority Research Questions for TB/HIV in HIV-prevalent and Resource-limited Settings. Geneva, World Health Organization, 2010.
. Evidence Gaps and Research Needs Identified during Tuberculosis Policy Guideline Development. Geneva, World Health Organization, 2018.
. The Research Excellence Framework and the “impact agenda”: are we creating a Frankenstein monster? Res Eval 2011; 20: 247–254. Priority-setting in public health research funding organisations: an exploratory qualitative study among five high-profile funders. Health Res Policy Syst 2018; 16: 53.
. Preparation for a High-level Meeting of the General Assembly on Ending Tuberculosis (WHA71.3). Geneva, Seventy-first World Health Assembly. World Health Organization, 2018.
. Global Investments in Tuberculosis Research and Development: Past, Present and Future. Geneva, World Health Organization, 2017.
. Funding for TB Research Recent Momentum Must Inspire Bold Commitments. New York, Treatment Action Group, 2018. Stop TB Partnership. The Global Plan to End TB, 2016–2020: the Paradigm Shift. Geneva, United Nations Office for Project Services/Stop TB Partnership, 2015.